Girls, you are in for a great treat! You know at Girl Meets Dress how much we love finding new products, and we just know you are going to love our newest find. Introducing Ohso – a luxury Belgian chocolate that you can enjoy every day (yes ladies every day)! From only 63 calories, each bar delivers your daily boost of friendly bacteria to assist the digestive and immune system. Made from 53% to 70.3% sustainable coca, Ohso’s chocolate is packed full of vitamins, minerals, fiber, antioxidants and is a great source of energy for anyone with an active lifestyle. Ladies, I think our prayers have been answered – we can now eat as much chocolate as we want, say goodbye to guilt and fit into our Girl Meets Dress outfits!! This week you will receive a delicious bar of Natural Orange chocolate with your order from Girl Meets Dress! It contains only 72 calories and has 53% cocoa, so there will be no problems fitting into your gorgeous dress. 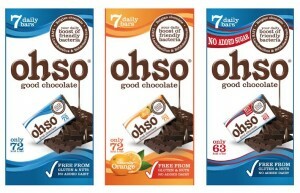 Ohso also has many other flavours (so you will find that right bar), which have barely any calories! The Classic bar contains 72 calories and has 53% cocoa, whilst the Plain and Natural Rasberry No Added Sugar bars contain only 63 calories and has 70.3% cocoa! ALSO you lucky Girl Meets Dress customers get the special offer of the 1st Pack Free and the 2nd Half Price when you join up HERE! In November Ohso are launching a new No Added Sugar flavour to the range and are running a prize draw competition! EVERYONE who guesses the next Ohso flavour correctly will receive a yummy bar of the new chocolate! PLUS two randomly picked people will WIN a three month supply of Ohso. All you have to do is register HERE! Posted November 19th, 2014 in Partner Offer. Tagged: Chocolate, Dresses, Energy, free, Girl Meets Dress, Health, Natural, Ohso, Orange, sample.